The 110,000 Missourians with Alzheimer’s project has published a collection of stories about Missouri residents with Alzheimer’s. These compelling slice of life stories show how Alzheimer’s or a related dementia has affected Missourians. 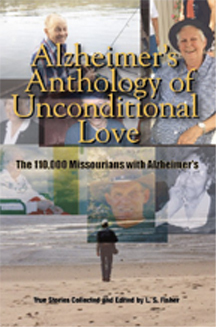 The books are available to the Alzheimer’s Association Missouri Chapters at cost and all profits will be donated to the local Missouri Chapter that sells the book. Approximately thirty-seven stories have been selected to be included in the collection. Linda is a longtime Alzheimer’s Association volunteer and advocate. She is an author and the editor of Alzheimer’s Anthology of Unconditional Love. She offers presentations based on her personal experience as a primary caregiver for her husband who lived with early onset dementia for ten years. She will speak to groups or organizations about Alzheimer’s or writing life stories. Presentations can be tailored for your group. Visit her website at http://www.lsfisher.com/ or email Linda at: earlyonset@hotmail.com.